I’ve been quite a good girl for a while now and not been shopping too much at all! Then recently I have no idea what came over me and LORD HAVE MERCY ON MY CREDIT CARD! These are amazing! 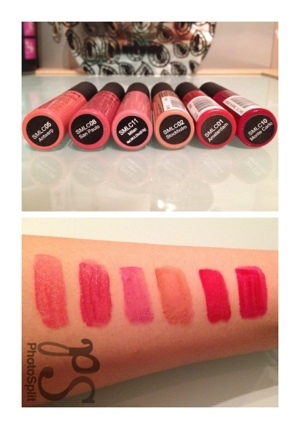 You can tell from the swatches that their pigmentation is amazing! Now just bare in mind that although they are creams, they do wear off after a while and they turn into regular stains. Do they get stuck in my chapped lips? Yes, the darker colours do but if you top up with lip balm every now and again they’re fine! They’re mega easy to apply with the applicator and a little goes a long way! As well as this, they have so many colours to choose from, you’ll be sure to find one you like. Ah! Stains! The dreaded word in the world of laundry but a god send in beauty! These are lovely! I especially like the purple shade! It has actually started a revolution of purple with me! I can’t believe how easy purple is to wear on your lips! In fact, I think I’ll do a blog post on purple make up :) these stains have serious staying power and glide on! They get stuck in the chaps of your lips but again.. Lip balm to the rescue! Personally, I love stains and I find them perfect to wear when I’m at work and out and about because of their ease and I really like these! The downside.. Not many colours to choose from which I think people would like.. They have too many stains in the pink family but I think having browns and more nudes would be better! I love Body Shop and I always have! They always have amazing discounts and their products are such good value for money! 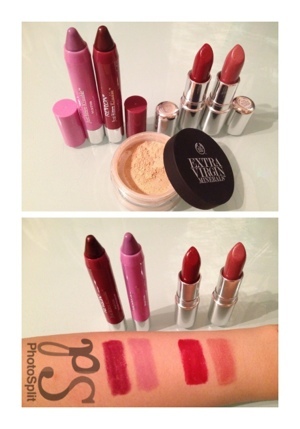 These lipsticks are lovely! I especially love Sienna! Definitely a “my lips but better colour” and I love it more cause it only has a subtle sheen to it! It’s lovely to wear day to day! Garnet was a brave choice.. Tip* to sheer out a colour swatch the colour on your hands and kiss it like so..
Swatch the colour on your hand or straight from the bullet, dab it on your lips! Instant sheerness! The foundation however, was a serious let down! Disappointment isn’t the word! I don’t like how body Shop put shimmer in everything! Although this foundation only has a slight sheen to it, I would have preferred none! Coverage is little to none and the colour.. I can’t tell if it matches cause it hardly covers! I think they should brand this as a setting powder rather than a foundation cause it does better to remove unwanted oily shine.. By adding shimmer.. Make sense??? I don’t know.. Body Shop.. Sort it out please!